Every closet has a skeleton, every herd a black sheep. No matter how sunny their public picture, every business, organization, family and person has a darkness within them. Whether it’s a secret shame, a terrible mistake or a great injustice, everyone does our best to keep going, because life does not stop for us. The pending murder charge against tight end Aaron Hernandez is testing Bill Belichick and the New England Patriots’ coping ability to the limit. In the first press conference of training camp, Belichick was forced to explain how he hired an accused murderer—soon, according to the Boston Globe, to be an accused mass murderer. According to NFL.com‘s Gregg Rosenthal, Belichick was humble, and sensitive to the Lloyd family’s loss of the Hernandez’s victim, Odin. He also, as head coach, took responsibility for drafting Hernandez, who struggled with discipline issues in college. 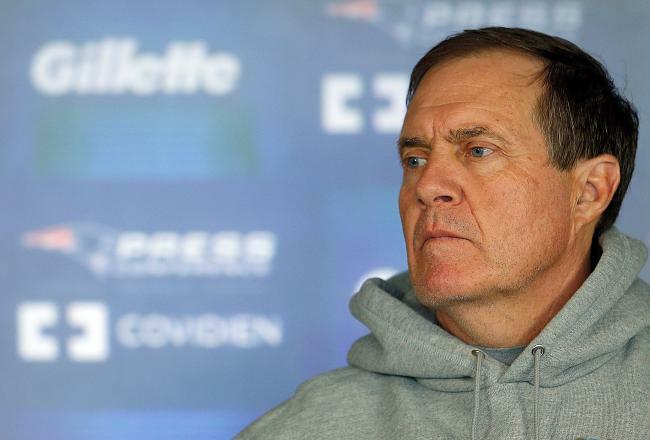 “I’m primarily responsible for the people that we bring into the football operation,” Belichick told assembled media. Belichick did the right thing by taking the blame for the damage Hernandez has done to the Patriots organization on himself. This is why Belichick and the Patriots organization are uniquely equipped to handle this situation. On many other teams, power and responsibility flow in many weird and byzantine ways. Albert Breer of NFL.com penned an incredible article spelling out how all 32 teams handle decision-making. His summary of the way the Patriots call shots? Of course, Belichick can’t truly take responsibility for what Hernandez has done. “A young man lost his life,” Belichick said, “and his family’s suffered a tragic loss and there’s no way to understate that.” There is no blood on Belichick’s hands; he and the Patriots (just like any employer) had no way to divine what Hernandez was allegedly capable of, nor would they have had any real way of intervening. Many have tried to connect the brutal, unthinkable crimes Hernandez has been accused of to his college misdeeds; this is silly. Many college football players—and regular college students—went through similar discipline issues. Many have tried to connect the PR damage Hernandez has done to Belichick’s drafting him; this is wrong. Much as the infamous BTK serial killer worked for a home security firm with strict hiring practices, there’s no way Belichick or the Patriots could possibly have foretold Hernandez would also be suspected of multiple murders. NFL prospects might be the most heavily screened of all job candidates in America. Besides every minute of their “unpaid internship” (college football) being filmed, potential draftees are weighed, measured, given a full medical exam, worked out on every aspect of their job skills, sometimes multiple times, do dozens of in-person interviews and even travel to team facilities for private, individual follow-up workouts. Beyond that, every aspect of the personal life is scrutinized, with NFL teams commonly hiring private investigators to tail candidates and report back to the club. Even with all this, Hernandez’s “character issues” were no greater than many of the candidates drafted by many other teams that season. In fact, according to Alex Marvez of FOXSports.com, Hernandez got a perfect score on a pre-draft pysch exam. These kinds of screens are designed to uncover the deep-seated issues that lead to dangerous or criminal behavior, and Hernandez passed with flying colors. Nevertheless, since Bill Belichick has unparalleled power and autonomy within the New England Patriots organization, when he faces the nation and takes responsibility, it means something. When he, according to Rosenthal, vowed to look at how they evaluate players and prospects going forward, it means something. Even if Belichick reviews his own evaluation process and concluded—with some justification—that there’s no conceivable practice that could have forseen or prevented this tragedy, it still means something when the unilateral decision-maker takes a hard look at the way he does things. Belichick has often been accused of being aloof, lofty and arrogant. He often deals with the media by not dealing with them at all. Belichick is famous for entirely dismissing some questions and giving terse, one-word answers to others. Even when Mike Silver of Yahoo! Sports reported Brady was “pierced in the heart” by news the organization had let go of his friend and top target, Wes Welker, those feelings came from a confidant of Brady’s, never Brady himself. That’s why Belichick had the power to deal with this unthinkable situation so gracefully, and did: No one in the organization will speak out of turn, and when the organization’s only words on the matter come from a humble, sensitive, gracious and contrite Bill Belichick, it means something. Coming from anyone else in the NFL, that might sound like a PR flack’s wishful thinking. Coming from Belichick, it sounds like the end of a painful chapter in the history of an organization that’s about winning, and nothing else. This entry was posted in Uncategorized and tagged Bill Belichick, New England Patriots, NFL by ferreiraderek21. Bookmark the permalink.